I read this book in one evening. If I didn't take a break to shower, it would have been in one sitting, which I basically never do (I hate sitting for long periods). 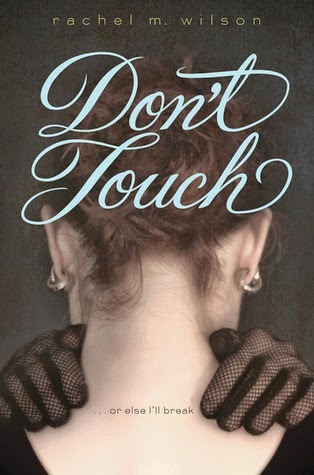 But Don't Touch isn't just captivating because of the issues of an anxiety-stricken girl it tells. No, it's so much more. I've tried my hand at "issue" books, specifically OCD-related problem books. However, Wilson's writing and realistic portrayal blew me away. I had low expectations. I read Corey Ann Haydu's OCD Love Story, which turned out to be a big bust for me, making me a little fearful of reading a similar book. At the same time, it gave me a little hope that maybe someone else would produce a book that dealt with similar issues, but in a different way. I'm not here to bash Haydu's book, because at the time I actually admired it a bit, but it left me with a sour taste in my mouth. Wilson, on the other hand, left my jaw open in awe and my brain scrambling for things to say to adequately describe my feelings. So you could definitely say that Don't Touch soared above my expectations. It'd be easy to think that Caddie's disorder or ways to keep it going are farfetched. I almost fell into that trap until I really dove into the story. The book is long and I sighed a little when I realized how much I read and we hadn't even gotten to her being in the play. But it's worth it. You get to see Caddie seeing her old friend Mandy for the first time in a while. You get to feel her and her brother's struggles of having their parents separated and dealing with a flaky father. It was really great to see Caddie meet Peter for the first time. And to watch Caddie simulate herself into Mandy's group of friends, even if it included pushy Oscar (who actually ends up being pretty decent later). It sounds so cliché, but when you read this, you will honestly be on the emotional journey with Caddie. I gained a better understanding in disorders and I think that's the most important thing. I always knew that they really can't help it when they're in the midst of it, but when they seek help, they can conquer it. But I never fully got it and this showed me how it works through Caddie's eyes. Like I said, I felt myself leaning towards the thoughts of it being farfetched in a couple places, but I went with the story. I tried to understand and tried to feel. For me, it worked. And really, unfortunately, I couldn't explain it well enough to do it justice. You'd have to read it. Because only by reading it would you feel Caddie's panic, pain, and emotional turmoil. By reading it, you'd invest your feelings into the characters and their relationships and progress. Which is another thing: relationships. Man, oh man, did I like Peter. Like many YA fictional couples, I don't think it'd actually happen in real life. I think IRL guys would definitely not put that much effort or time into a girl and potential relationship. A girl can hope and that's what was great to read this: it was great to imagine. Peter is a gentleman. He's extremely and the most patient, gentle, and sweet. His introduction to the story, the lively exchange between him and Mandy then the unnerving exchange between him and Caddie, was perfect. I felt like I was actually there, watching it all play out. Peter is there being a friend for Caddie and potential boyfriend through the story. Always putting himself out there, but not trying too hard so he doesn't scare her. The scene at the party was another instance where I could picture their interaction vividly (claps for Wilson). I became a little disgruntled at the kinda unresolved ending, but I understood that, really, in a way, it was resolved. Lives aren't always happy and not everything will be perfect. So while I like my happy endings (and don't worry, there is one), I fully appreciate that Wilson didn't tie up the book with a neat, little bow. Since I'm already praising Wilson, I'll go a little further and say that the author's note was one of the best author's notes I've ever read and a great addition. Not only did it give the story even more depth by adding her personal story, but it was personal all-around with her sincere advice and encouragement. I only hoped that the right people would read Don't Touch, stick around for the author's note, and find the answers they desperately need. I have so many words I'd like to say and feelings to express, but it's late (I actually mixed things up and am writing this review the same night as reading/finishing the book, which is HUGE) and my brain can't handle the thoughts and emotions any more. I'll probably go to sleep thinking about it though. Verdict: A story everyone should read. I'll admit I wasn't sure if this book would be good - the synopsis wasn't calling out to me, and I haven't seen many glowing reviews - but I'm beginning to think I need to give it a shot. Your paragraph about how the story helped you understand what it's like to have OCD/severe anxiety is what really got me - the writing sounds so vivid and emotional. And on top of that, it seems like the story has my kind of ending. Thanks for putting this title back on my radar!